Protests in Zimbabwe City's following the increase in diesel in petrol prices. Zimbabwe has seen protests in various cities on Monday following the more than double increase in the prices of petrol and diesel in the country. Protesters began by burning tyres and boulders in the cities of Harare and Bulawayo showing their anger over President Mnangagwa. Minibuses heading to Bulawayo were attacked by protestors by burning tyres and some schools got closed for fear of loss of lives. Mugabe’s successor came to say that the increase in the price of diesel and petrol is aimed at removing gaps that came as a result of illegal trading and increase in use of fuel. The country is also producing less than it’s importing from outside which has caused loss in the value of a dollar. The increase in the price of diesel and petrol has led to the opposition and trade union call for a three day strike in the country. However heavy riot police deployments are in the towns of Harare and Bulawayo to stop the protests. The hike means petrol prices rose from $1.24 (£0.97) a litre to $3.31, with diesel up from $1.36 a litre to $3.11. 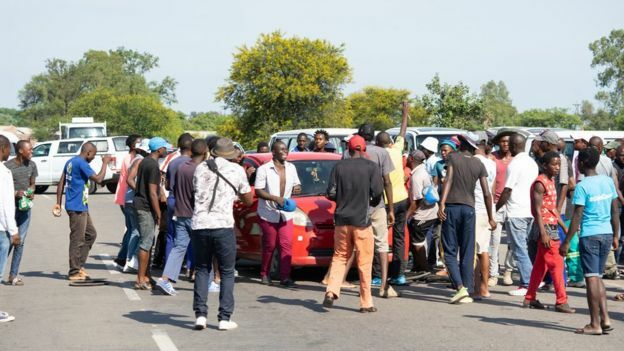 Minibuses heading to Bulawayo were attacked by protestors by burning tyres and some schools got closed for fear of loss of lives, AFP reports. Nelson Chamisa who is the leading opposition figure in the country said the state is in a national crisis. “We have a national crisis which is descending into a humanitarian crisis.”Chamisa hinted. Mnangagwa came into power in November 2017 after long term serving president Robert Mugabe was forced to resign after massive demonstrations.